The LOST ARGs: The video is here - First Episode title is revealed. The video has finally been posted, (Click here to view it on YouTube) it deals with Pauls visit to the studio and his discovery of a shredded front page for the first episode of the last season of Lost. If you are episode title sensitive then don't read the last screenshot information. This is not a confirmed episode title, just something shredded and found in a dumpster. 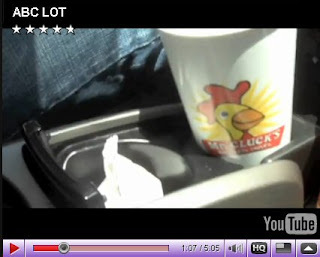 A Mr Cluck's cup in Paul's car. Paul disguises himself as Mr Friendly to get past the security guard. Paul has a map of the studio that does not seem to be too accurate. While searching for Damon and Carlton, Carlton walks past Paul and bumps into him. While Paul searches the dumpster, Damon walks past telling someone on the phone to "...make him dead". 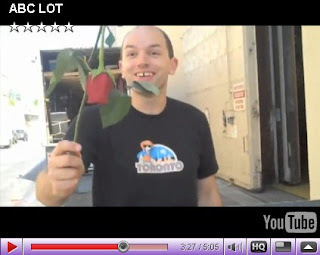 Paul finds a rose but then, after messing around, his camera man breaks it and Paul say's "You broke the rose"
A set design for a temple set is found, set number 493 for episode 601. Next a bundle of shredded paper is found. Paul is then chased away from the dumpster. Paul has put together the paper that we saw in the picture he posted a few days ago, the page is the front of an episode script and Paul says it is LA X (note the space). Oddly enough on the blog post the same page is displayed a lot more clearly but the title is blanked out by a black bar. The camera man for the shoot appears to be another comedian called Scott Auckerman, see his Twitter page for some comments about the video. Also the large picture on the Paul Scheer post points to Scotts pages on Tumblr. the map looks like the one of the stations with the lines and circles on it. My thoughts on the potential title is that the X may stand for something else that we have to wait for. I had to take the screenshots for the frontpage twice, after all the messing about with the video and saying the low res version was not good enough so we had to wait for the high quality version, the low res was posted anyway ! Then a few minutes after I had created the screenshots the high quality one was uploaded. Thanks for the link above Sawyer840 I'll check out the rest of the info on your site. The Rose is a Dark Tower reference. In that series, the Dark Tower is a lynchpin for all of the realities in the multiverse. In our reality, the Dark Tower is represented by a rose. If the rose is harmed, the Dark Tower is as well, imperiling all creation. I think that's the significance of the comment "You broke the rose." That was a great video - I need to watch it again! But to me this does't look like ARG - it's more promo for next season (of course for hard-core fans only). Also, the map resembles the layout of stations on the Blast Door Map. The drawing also looks like Dan's notebook drawing of imaginary space and time, with the crossing lines and circles. Interesting about the broken rose, Big. I appreciate the humour in the video and what it is trying to do, but at the same time I was hoping for something more solid to get my puzzle solving teeth into. Ah, Bigmouth - you beat me to it on the Dark Tower reference! That's exactly what I thought of, too. Another reference to alternate realities... interesting. I've just updated the main post as it was looking a little odd in IE8, and added the Dark Tower reference mention. Also DT related - in our world, there is a group of people that protect the rose, thus keeping that version of the tower safe. Is there a similar group for the island? Protecting the rose? That's like The Little Prince also. Sounds like the "whats in the shadow of the statue" people. Ooh, good point, Zort! I think in DT, they are called The Friends of the Rose. Maybe in Lost it's The Friends of Jacob? Or The Friends of the Island? I have to agree with you, zort. I guess I shouldn't get my hopes up too high thinking that this could ever be like TLE. At least at this point, I keep getting the feeling that TPTB are giving us something that's just a clever distraction... they'd never give away what's really going to happen in season 6, IMO!! I was bored so I tried overlaying the map and circles Paul had over a studio layout. It doesn't help, it just gave me something to do ! This just seems like a fun diversion to get us talking about S6 (as if we need something to do that)! I'm hoping more will develop on the 15th/16th. Paul Scheer is pretty funny...as are Darlton. 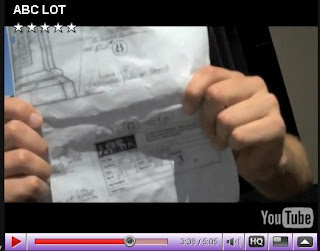 hey Zort70, can you overly that over rousseu's map on paul sheerer's blog?? When Paul uploaded his video to the DCPB website, it ruined the way the blog comes up for me. Now the posts don't look the same, the space between the pictures is increased, Paul's bio is down at the bottom, etc. I've tried refreshing and shutting down the computer, but it still comes up all wonky. Can't read the comments posted on the video post. Anyone else have this problem or know what I can do about it? I'm with you maven, wondering if this is really an ARG or if it's just a fun diversion/promo. I'm beginning to think the latter. Although, DarkUFO was supposed to check to see if it was official- never heard any word, but he did start a new forum thread for the "ARG"- so I don't know if that is confirmation or not?! Waiting until Friday is not much fun! Same for me too scoutpost. the site went haywire with that video. I hope he fixes it soon. Yeah, the site is doing that to me too. I figured something was wrong with my connection but I guess it's something on his end. I was thinking it might be interesting to see the map of the island from DCPB with the lines & circles from the video, too. If no one else does it and I get bored enough (not likely this week!!) I might give it a try. I'm not having any problems with his sie. Strange. Paul said his web guy is working on the site and it should "hopefully" be fixed soon. I just checked and everything seems normal to me. Click here to see the same overlay on Rousseau's map. Yes that makes some kind of (weird) sense. Does that mean that the first episode will start with a plane landing and Charlie getting off ? Dr Mum - If Paul wasn't a real person then I'd be jumping up and down now, perhaps he was chosen because of his anagram possibilities ! Anonymous - how about this image as a possible representation of that answer. So, the episode name is confirmed.. hmm. I was thinking of a whole new idea on the X in "LA X" You know how we say 3 x 3 = 9. In words it's three times three equals nine. So, why couldn't the title be "LA Times"? And isn't that the name of the newspaper in LA? maven, I've been thinking along the same lines as you with Darlton's continued shout-out to the die-hard fans. Nice work on the map Zort! I was thinking though, doesn't that bottom circle look like it has a partial question mark in it, like for the Pearl on the BDM? Having said that, I really hope that how you've placed it means something, because I like craters, and I've always hoped that our island crater would come into play. Maybe it's where Jacob's and MIB's spaceship crashed on the island, heheh. That stinks. So much for me staying completely spoiler free this season. If this is going to be nothing but a bunch of spoilers for season 6 I think I might just quit following this thing and catch up on it later after the season starts up. Sayid'sgirl, I think Dark was refering to the ARG being official if you read the comments around his on that site. I'm still not convinced that this is the full title, I think the X part is yet to be revealed. Stay with us as I'm sure we won't get a major spoiler that will stop us enjoying the final season. I'm surprised that the title was confirmed. Doesn't Darlton abhor spoilers? A lot of people consider titles spoilers (like Sayid'sgirl). Yes, BS, LAX is also L. A. shorthand for Los Angeles Times. Sorry about those multiple posts. Blogger is acting up on me today. I's usually the opposite for me Maven, I try and post and it takes me 5 times to get it to accept my username and password ! Personally I don't consider the title, even if it is official, a true spoiler as there is no context. There are several interpretations of it already and although some sound convincing, I'm still none the wiser. I'd say the videos shown at Comic-Con were more of a spoiler. LOL, if only that were true, that would be hilarious! and fun! So I'm with you guys...it is unlike Darlton to reveal things this early on, and with all of us spoilerphobes out there, you'd think they wouldn't go too far...on the other hand, this hasn't really shaped up yet to be much of an ARG. So I wonder what to expect...I am a little confused by Dark's statement, he does seem to confirm that this is an ARG in a very round about way. I guess we just have to keep an eye on the DCPB site and if nothing else wait until the 15th. Hopefully they will do something that will make it clear exactly what this is! I'll stick with it for awhile. I'll wait and see what happens Aug. 15th. The thing is I never expected or wanted the bomb to take them back to LA. I think they belong on the island. If they get off I'm sure I'd like that. As far as the Comic Con videos I just looked at them as fun nothing important or canon. Or a clue that they changed things and got off the island. The problem with someone official saying this is an ARG is that it takes some of the mystery away from it. I don't want someone to tell me definitively what this is, but atthe same time I want to know that I'm not wasting my time. At the moment I'm in the, happy to go along with things whatever the outcome, category, but if Hans Van Eeghan turns up I'll change my mind very quickly. That should say I'm not sure that I'd like that. BTW maven I don't think Damon and Carlton look at episode titles as spoilers. They usually give out next weeks titles in their podcasts. Lol Zort! If Hans shows up again lets GET HIM!!! Thanks for the Island map, BTW. Not sure it helps at all but interesting. I think that it's fun to see this Paul guy and I'll stick with it. It may not be a game or whatever but it's fun to follow so far. The video cracked me up, regardless of whether it contained "clues" for anything. A proposal: Its my belief that this ARG may be the most challenging. Yes, I do believe I am up to my armpits in this ARG. I did receive a print from Paul of the DC&PB and I did receive a letter from RMA. Consider, Alternate Reality Game. The challenge in this one ,,may not be in constructing an end ,,as in a finished puzzle,,or a product of linear clue assembling,,as in, a+b+c+d+e=x. As an Alternate Reality,,the challenge in this one,,is to learn or be able to perceive in an alternate way. Rather than linear thinking, an alternate may be ..spherical, or " parabalic"..Feeling and Intuition rather than Logic and reason. What is being presented to us as an ARG..is for us to see as METAPHOR. The message in this ARG is The Metaphor. Consider, the master of ceremonies of this ARG.. is a comedian, the " Joker" of the deck of cards,,the " wild card" in this game of chance. His art, his video,, both great metaphors. His video, while some see as far it possibly being a satire of the crazed LOST Fan,,is really a charming parable of Life. He starts off on his quest, all full of goals and anticipations , basically built on fantasy,,sets on his Path with dreams in his head,,and by end,,none of those dreams are realized,,but ,,he comes away with completely different rewards in his hands. Its so goofy,,its laffable..but in a 5 minute nutshell, is this not what happens.? And are we not the outside looking in,, being asked to get involved?.. A slapstick parable on Life itself slipped in right under our noses. Capcom said ".. I really hope that how you've placed it means something, because I like craters, and I've always hoped that our island crater would come into play..."
I was just trying to think have we seen anything on the show connected to the crater ? If not then it could be something to explore in the final season. Mel, yes indeed a great way of putting things. Basically through the actions of a fool (nothing personal Paul :-) )we have things revealed to us that mean something outside the context of the superficial presentation. Yeah, even if it is the real title, it doesn't say much. If it was titled "Madame X" it still wouldn't tell us anything. Except for the fact that we are half expecting them to get to LAX in some way (FB, FF, FS) it doesn't reveal a lot. Still, I hope that they are VERY careful about not tricking us into seeing something that we don't want to see. That would not be very nice. well, Paul told me to just watch out for the 15th, then things were goint to get interesting ! Zort you'r right, I think that so far all we've seen mentioned of the crater is on Danielle's map labeling it. Lisa, how did Paul tell you ? The more I think of this Paul Sheer video that we got today, the more I think it's TPTB making a funny statement about us rabid Lost Fans. 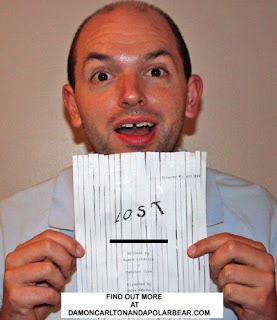 1) Paul is obviously a rabid fan.. has his own 'Lost' blog, going to comic-con, creating Lost "Art" and even has a Mr. Clucks cup in his car. 2) He is delusional about his creation (his painting), calling it 'awesome' and saying that Damon and Carlton loved it. He just can't believe they would throw it out! Now, I don't want to hurt anybody's feelings here, but how many of us would think ANY velvet painting would be 'awesome' enough to think of hanging it in anyplace other than maybe in our basement furnace room?! I'd like to see hands here.... LOL! He fantasizes about his "theory" that Darlton will welcome him with open arms and even ask him to help with the scripts of Lost (once they realize Paul put his fan-fiction on the back of the painting.. LOL) We rabid fans have been known to think our Lost theories and creations are spot-on true and wonderful (or maybe even better than the show itself) and worthy of praise by all, right? 3) In typical rabid-fan style, Paul will do anything, including faking his way in, to get an audience with Darlton. I envision similar things maybe happening in Hawaii with fans trying to see the actual shooting of the episodes (and who knows? maybe going through the trash) so they can report back to us the juicy spoilers they've found. 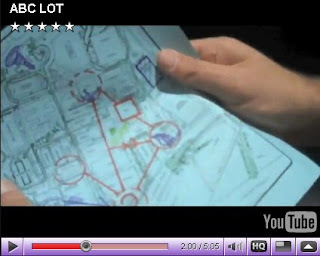 4) Paul is so engrossed in the map he made and so excited about being there, that he doesn't even realize that he's in front of the office building that he's looking for and totally misses the fact that Carlton runs right into him and Damon walks right by him talking on his cell phone. That's a bit like not seeing the forest for the trees. Are they subtly accusing us fans of that? It also reminds me of the idea that when it's all over, we'll all be saying 'It's been right in front of our eyes the whole time.' LOL! 5) He's such a rabid fan that he even knows which day of the week the trash goes out.. lol! 6) The things that he does find in the trash bin are, well.. they are trash! I was being really skeptical last night that this was even an ARG, so it's interesting that we're finding out it will be. Maybe they are telling us we need to look at the bigger picture and not get so bogged down in riddles this time?? When I made my Lost quilt I was worried about copyright infringement of the images (of course, it's for personal use and I will never sell it). I thought ABC and/or TPTB would come after me! So I really identify with Paul and his fan art! Yep, maven.. you and I were thinking the same lines. That's right, you have a more personal identification with Paul and his fan art! LOL! Mel, that book sounds really interesting (I might have to check that one out). And I totally agree that we will see a unification of sorts in the end. And the Losties have to all get together again in one "timeline" because the Island still needs them!! Paul has just posted about Seth Norris. I read this earlier today but it sounded like it was in the category of casting spoiler so didn't say anything. So are going to be getting 3 new works of velvet art then? Also looks like Paul's blog is going to used for spoiler tidbits...to keep us enticed for S6! BSwan..The Egyptologist is like no other book you've read,,except,,if you have read the original Dracula. Its in that style,the " epistolary " style. Its as dark if not darker, as LOST and hilarious at the same time. If one understands that its about dreams and imagination becoming real,,from the beginning, then it unfolds beautifully. Again..like LOST. Creating ones future, fro.m what we find in our unencumbered Imagination,,is the surreal "path" to a unified person. I agree scoutpost. I don't mind spending time looking for clues if they're there to find. But if they're not, I'll just follow along at my leisure. It is something fun to follow until season 6 starts. I wonder if the three pictures will be on Paul's site or whether we will need to find them on the web ot in real life, like the glyph hunt. Glad your enjoying it thin, I'm off to bed now, see you all tomorrow. I thought the "Dharma Wants You" ARG was cancelled by abc because of money issues. What would prompt abc to begin a new ARG now? Did the network get some of the baillout money or did Hans strike it rich with the 'cash for Dubai clunkers' program ? Right Mel, the "alternate reality" this time is just the imaginary trek that Scheer is on with his painting and troubles therein, that we get to witness and possibly participate in to a degree, if we get to snoop around a website or something. Too funny Thin. I would guess that it was Hoodlum's financial problems last year that were most of the problem. But ABC has some deeper pockets than they did, for this year. For ABC, it's probably the same amount of promotional money to either put up bunches of billboards nationwide and create fancy mixed media ads, or to play some shenanigans with an actor, some home movies, and a fake website. Heheh. Cap..Alls I can say is,,I have a print of DC&PB that was Gifted to me by Paul, simply because I was interactive at his websight,,So , standing around and watching,,will get you just that,standing around and watching. The key to this ARG may lay in being active at Pauls sight. And I swear, If the RMA sight ever opens to interactiveness..It will suffer terriblely. 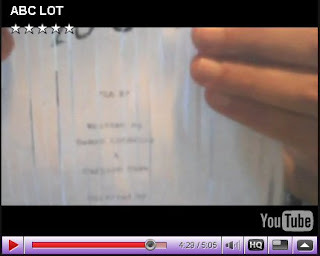 What I am saying is..Write Your own script to this ARG. Go to Pauls DC&PB site and post.. post like you are talking to him face to face, hes a comedian, so post your sense of humor, let yourself loose at his site. have a ball. One warning tho..no jokes about Britney Spears..I laid a few down at pauls site and they got edited out faster than Britney ..you remember her rite, Britney Spears..anyway, faster than britney cut all her hair off.so becareful of celebirty bashing. Again.. one has to realize that there is infinite Alternate Realities,, not just one. so, its like,, every one has their own Alternate Reality..Our duty is..to express each of ours. There by ,,we create " art". We all become " artists". Imagination and reality become one,,unified. 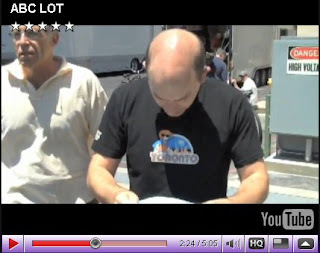 If you have access,, it seems to me that is the message of the three sneak peak videos they showed at Comix Con. I agree Mel! :-D This hiatus thing, whatever it may be, would be nothing without Lost fans' participation, for sure. Yes, I did notice the rose...in Rosicrucianism, it denotes the "blood of sacrifice." It can also denote the heart or "where your treasure lies."